QuickBurst 26 AWG Shooter Wire sells for $.25 per foot. 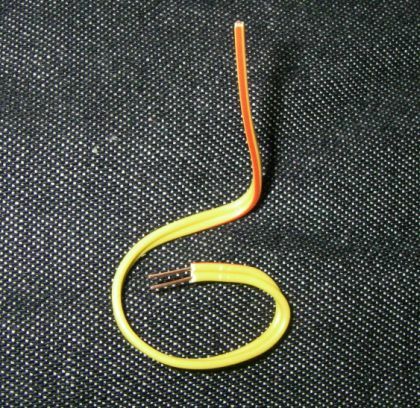 Here is the Shooter Wire that is so popular for making igniters. This is twin solid copper conductor lampcord or Shooter Wire. Now you can buy it by the foot. Order as many feet as you wish. The wire is normally yellow with a red stripe down one conductor. Great for making larger igniters (29mm G’s and above). Actual wire color may vary. Shipping is $5.00 for the first foot and .03 cents per every added foot. Quoted shipping charges are CONUS only. International shipping is available, e-mail for a quote. 26 AWG solid copper core, twin conductor (lampcord). DC Resistance per 1000 feet = 40.81 Ohms at 25 degrees C.